You don’t have enough time to start and finish the project, so you don’t start. Or, you aren’t sure about all the steps that will be required to get the job done, so you don’t start. Or, you don’t have the resources (time, money, containers, etc.) to do the project all the way, and so…you don’t start. 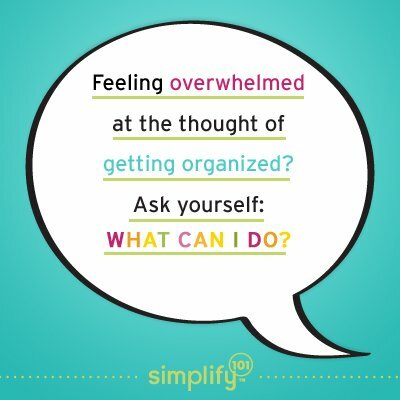 See, when we’re feeling overwhelmed by a project, organizing or otherwise, what’s ultimately getting in our way is all the thoughts about what we can’t do…I can’t finish it, I can’t afford it, I can’t figure out how. Asking “What can I do” stops that thinking dead in its tracks. You begin focusing on what is possible and this will help motivate you to get started.By the way, I used this question this weekend to break down some barriers of my own. Want to know the results? Here’s just a partial list of items checked off my list, simply by focusing on what was possible: I organized a makeup drawer, touched up trim paint, washed the dog, cleaned the car upholstery, and swept one half of the garage. Not a bad return on investment for four little words. So…what can you do? Let me know out in the comments! I have failed to start so many projects because of the reasons you listed (and more)…it took me a long time to realize that just because there are some obstacles, it doesn’t mean I can’t get started. Now I’m much better, because I realize that I can still make progress, even in increments, and that each increment is very rewarding! And often I have surprised myself by accomplishing more than I had thought I could. Completely agree with this! I’m going start this weekend. It’s all in the mindset..
s o m e t h i n g, even if it seems insignificant it still needs doing. Gotta’ go and get something done! Being overwhelmed because there is not enough “time” to get things done – so I’m adding another element to your suggestion of “What can I do” by actually “timing” each activity and making a note of it, on my master to-do list. Much to my surprise, it does not take as much time as I thought to complete some chores (like vacuuming, cleaning the kitchen counter, and handling the daily mail). Now I realize that it is a very small amount of time to perform each task…and I do have enough time for many tasks. No more “making mountains out of mole-hills”. Thank You, Aby, for your continuous inspiration! I love this! Today I can clean out my emails & catch up on some blog reading while at work. Tomorrow I can go through the pile that is on the rocking chair. It is summer clothes to be put away & the den will look so much better once that is done. I always tell my kids that they can work on their bedrooms for 15 minutes (or about 4 songs)…I should take my own advice. No distractions for 15 minutes to just work on one area. Great advice. Thanks for the motivation! I Love this advice, Aby. It is so true! I always have a hard time getting started on projects or I don’t finish them for the very reasons you mentioned. I am moving forward with the things “I can do!” Thanks!